At the Yasodhara Ashram we observed Buddha Jayant on the full moon day in April with a long meditation. It is good to meditate on such occasions. It is good to ask ourselves frequently: "Why is it that in spite of the teachings of the great masters like Buddha, Jesus and Krishna, mankind is still groping in darkness? What have we done to them?" We worship them. We read their teachings. We recite their sermons. 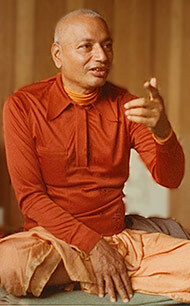 Then, we argue endlessly about which is true and which is not true; we argue about the nature of God, etc., etc.. These have no relevance to our life and, what is worse, such polemics divert our attention from the most vital truth embodied in their teachings — that as long as our life is ruled by selfishness, we shall continue to be tormented by sorrow.